Extremely rare circular cloud formations are increasingly appearing around the world. Media explanations for this extraordinary phenomena not only defy logic, they awkwardly deny the alien presence. "Such a hole was also noticed during the O'Hare airport sighting of a large ship by United employees on Nov 7, 2006. We have stated that such sightings, over places that will be shortly devastated by plate movements, are being warned not only by the sighting itself but by telepathic warnings given to the populace. South Carolina was one such place to report a UFO blitz during this same time period. "What causes the holes? The recent evacuation of a mothership or large ship, which was there, but concealed by the bending of light rays around the ship. Once the ship leaves, on a cloudy day, the hole in the clouds is at first apparent!" Such cloud holes should not to be confused with meteorological anomalies such as an incomplete tornado. "Air updrafts or downdrafts are not uncommon, the most common form the tornado. Here cold air is above warm air, capping the warm air, so that it is only allowed to rise in weak spots in the cold air layer, causing a swirling tube of warm moist air rising through the cold air layer - the tornado. The circle in the sky over Moscow is an incomplete tornado, in fact the remnant of an incomplete tornado. The cloud cover has been broken as rapidly rising air broke through a cold air cap. The reason the cloud cover seems broken, revealing light only at the edges of the circle, is due to the rapid movement of swirling air at the edges. As is known, a tornado has a calm in the center of the swirling tube, the high winds at the edges of the tube. The calm in the center of an incomplete tornado allows the cloud cover to remain in place, where at the edges of the swirl the cloud cover is torn away." "There are dozens of motherships hovering around Earth all the time. There are many groups visiting Earth at this time, and they all have their own craft. They are hidden from view, but will show themselves when appropriate. Indeed, mass sightings are increasing, sightings of large craft that cannot be denied because so many people see them from a distance, at angles that correlate. These people talk to each other at the local bars, if the media doesn’t carry the news, and in general an area as large as one of the US states can become firm believers simply because they have shared information among extended families and coworkers. This is what happened after the Arizona sightings in 1997. "Motherships are there all the time. You simply don’t see them. You can be right under one, and you won’t see it. Why? Because we have distorted light rays and we give you a view of what is above the mothership, from below, so you think you’re looking right through it where you are actually looking around it. If this seems amazing, think about how light rays change when they go through water. People accept the fact that they see things at an angle when they are under the water. Bending light rays is no big deal, and we do it all the time. The mechanism we use is not a gravity field. It could scarcely be gravity, as the force required would compress us to the size of a pea, and of course we would not live. We use other means, something that doesn’t affect us personally. Light is a particle ray, and is influenced by many particles that are similar to it, repulsed or attracted, and we simply utilize those elements, which are unknown to man. Man has scarcely scratched the surface in an understanding of subatomic particles. We don’t claim to be experts but we are far more advanced." A hole punch cloud was seen from Al Ain in the United Arab Emirates and also from neighboring Buraimi and Maḩḑah in Oman on the morning of March 17, 2019. A hole punch cloud was photographed above the Detroit suburb Southfield, Michigan by Rich Russell and reported by local FOX television. The same hole punch cloud was photographed by another Michigan resident and posted to Facebook. A hole punch cloud was photographed above Crothersville, Indiana by Eric Anderson and posted to the Facebook group Kentucky/Indiana: Cloud Watchers. At least two (maybe more) hole punch clouds were photographed in the region around Vancouver, British Columbia on January 28, 2019. How many hole punch clouds were spotted near Vancouver, Vancouver Island and nearby in Washington State throughout the day is difficult to tell. The photos online are taken from different vantage points and at different moments as the original hole shapes move and their appearances change. Bridget Kelly took this picture of an interesting looking circle in the clouds above Roanoke on Friday afternoon. This type of cloud formation is known as a fallstreak hole or a hole punch cloud. The hole punch cloud (or fallstreak hole) was photographed by Joe Schmedlap above Lacey, Washington on January 1, 2019. 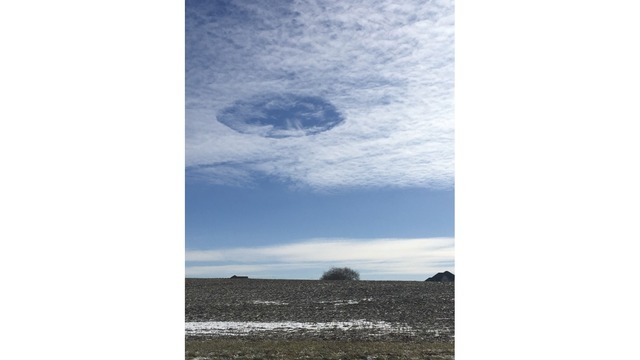 A woman shared photos with FOX 17 News that showed a hole in the clouds above Chapel Hill, Tennessee. SkyWatch17 Meteorologist Justin Chambers said what Lorena DLalvay actually captured on camera was a hole punch cloud. Folks around the San Francisco Bay Area were treated to an otherworldly spectacle in the sky Friday. What's known as a fallstreak cloud was spotted by many in both the East Bay and on the Peninsula in the late morning. These stunning formations are also sometimes called hole punch clouds because it literally looks as if something punched the sky with cloud puffs dissipating from a large elliptical gap..."
Posted 7 Aug 2018, The bizarre clouds kept many people in Brisbane staring at the heavens. A cavum, also known as a fallstreak hole, hole punch cloud, punch hole cloud, or skypunch was observed over Brunei International Airport on the island of Borneo around 10am on June 13.